Shoppers near Kelowna, BC searching for an affordable pre-owned Honda model are in luck at Buy Direct Truck Centre! Buy Direct Truck Centre offers an extensive inventory of vehicle from Honda, as well as other brands. With a constantly changing inventory, you'll want to keep an eye on what we have in stock! Buy Direct Truck Centre of Kelowna, BC wants to be your destination when it comes to pre-owned Honda models. We currently offer a number of pre-owned Honda Civic models (2003-2010). In addition to affordability, a used Honda Civic will offer drivers efficiency, dependability and more. 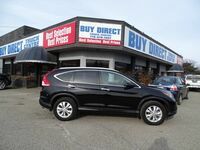 In addition to Honda Civic models, Buy Direct Truck Centre's rapidly-changing inventory currently offers Honda CR-V and Odyssey models, as well. The Honda Odyssey is one of the most popular minivans on the market, and Honda CR-V models offer versatility and fun in a convenient crossover SUV package! Buy Direct Truck Centre of Kelowna, BC is a can't miss destination for shoppers in search of a quality pre-owned truck, SUV or car that you can depend on! Buy Direct Truck Centre also offers a large inventory of vehicles featuring wholesale prices - no matter what your budget is, we have a vehicle for you! Trade-ins are always welcome and we offer free appraisal in under 30 minutes! Buy Direct Truck Centre also offers individualized financing plans! Contact us or stop into Buy Direct Truck Centre today!